Many economists like to say that price limitations – including wage regulations – are bad for an economy. And they are right. Most of them are just omitting the biggest price limit of all: the zero-lower-bound of interest rates (ZLB). The ZLB is practically the minimum wage of capital. The same economists also argue that (most) subsidies distort the market. And they are right. And one of the biggest subsidies in our current economic system is the fact that the government guarantees bank deposits (as the entries on bank accounts are misleadingly called) practically for free. This encourages excessive hoarding of liquid credit, which destabilizes the macroeconomy and, especially, makes it very profitable for banks to overleverage themselves, i.e. to hold insufficient shareholder equity to carry their risks. This is because it allows them to impose their business risks (mainly the volatility and default risks of their assets) onto taxpayers without their credit costs rising. According to the Modigliani-Miller theorem, credit costs would otherwise rise with leverage, offsetting the higher expected returns for shareholders. As risk-free credit is wholly unproductive, we could summarize the situation by saying that, currently, a large amount of capital is on a massive unemployment support! This results in a chronic oversupply of capital – which means a momentary oversupply of labor. No wonder we have persistent unemployment and deflationary pressures – and would have even more so without wage regulations and sustained government deficits, which are compensating for excessive private saving. In a working economic system, the market interest rate should be determined by people’s willingness to save (the “supply of capital”, the inverse of people’s “time preference” or impatience to spend) and the availability of profitable real investment opportunities (the “demand for capital”). Essentially it is meant to keep the credit market in balance, i.e. keep the amount that people want to be owed by others (i.e. save monetary assets) equal to the amount that others want to be in debt. This is practically the same as keeping the aggregate supply and demand of labor in balance, as monetary saving occurs by an individual earning more than he spends and invests in real assets (buys labor). When people want to hold less monetary savings than others want to be in debt, there is more demand for labor than there is supply of it and the competition over the limited labor causes upwards pressure in wages, which results in inflation – a rise in the general price level. The “conventional monetary policy” of central banks in modern credit money economies is practically keeping inflation stable by keeping aggregate demand and supply in balance. (Supply is often affected less as people seldom have the option of working less.) This, and the fact that most money (liquid credit) in today’s system is matched by private debt, is why it has been so effective at maintaining price stability. 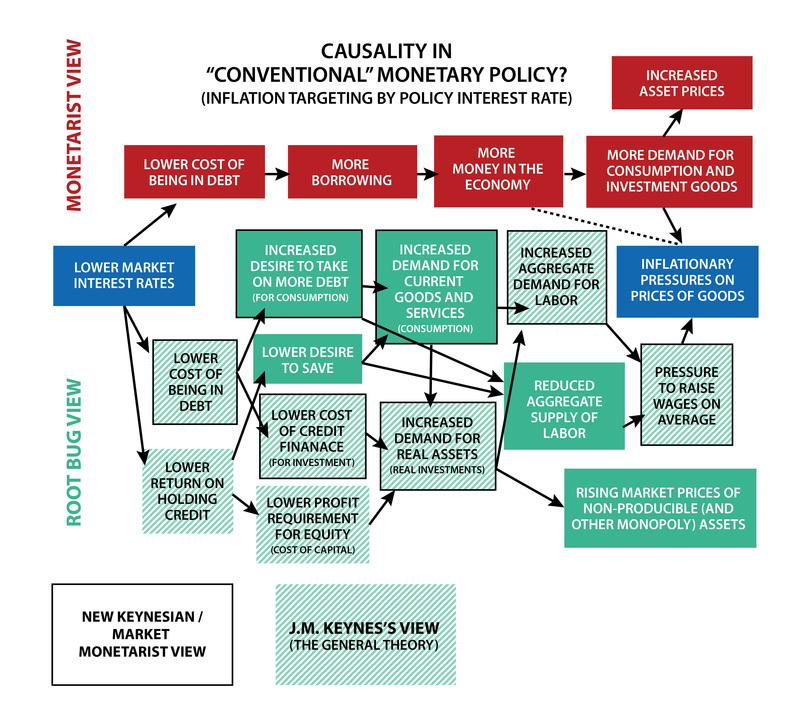 Mainstream monetary policy has arrived at this “right conclusion” partly by accident, as many monetarist and New Keynesian models still assume the causality between the interest rates and inflation pressures to run through the money supply. The effects of conventional monetary policy (interest rate adjustments) on the price level via aggregate demand and supply. Why commodity currencies (and others of inelastic supply) are inherently unstable (constant speculative bubbles) and, together with private land ownership, are useful tools for usury and extortion. Why “money supply” and “the supply of money” are very misleading terms that can be interpreted in many ways. Eliminate cash: This starts becoming a feasible option in many developed countries where electronic money (e.g. card payments and account transfers through e-banking) are already more “liquid” (a more commonly accepted form of payment) and less costly than payments in physical cash. Adopting a higher target inflation rate (in the range of 6-10%): What matters in the end is not the nominal interest rate (the percentage paid on loans or deposits), but the real interest rate: how much the purchasing power of credit savings and the debts (are expected to) change. Inflation stability, i.e. the predictability of prices, is important. Unexpected changes in prices are practically immediate wealth transfers between creditors and debtors. But there are few valid arguments for why the inflation rate needs to be as low as 1-2 %. As long as inflation is predictable, it can be compensated nominal interest rates. The only difference is that, with higher inflation, physical cash has higher holding costs and there is more “room-to-cut” real interest rates to keep inflation stable. Explains how real estate bubbles are not caused by “too low interest rates”, but the monopoly nature of land, and how implementing LVT together with eliminating the ZLB can mitigate adverse housing market effects. Lower interest rates on government debt, making the government earn additional “revenue” when rates are negative. “[I]t is time for central banks to stop pretending that zero is the floor for nominal interest rates. There is no theoretical or practical reason for not having the Federal Funds target rate and market rates at, say, minus five percent, if that is what your Taylor rule, or whatever heuristic guides your official policy rate, suggests.